MoparTshirts.com is website to help you find Mopar Skull and Mopar M T-Shirts that we have designed and have listed on TeeSpring easier. All purchases are processed through and fulfilled by TeeSpring on their website. MoparTshirts.com is not associated with or a part of TeeSpring or any other T-Shirt supplier. 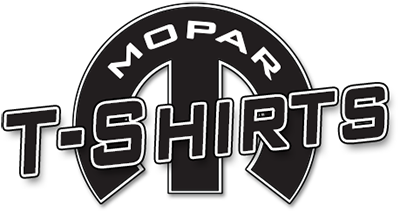 MoparTshirts.com is not associated with or a part of Fiat Chrysler America, Mopar, Dodge, Chrysler, Jeep, Plymouth, Ram, SRT, Fiat, FCA, Desoto, Maserati, Alfa Romeo, Lancia or Abarth. MoparTshirts.com understands that you may have concerns about safeguarding your privacy on-line. The Privacy Statement that follows explains our views and practices concerning privacy, and how they may pertain to you as you make full use of our many offerings. MoparTshirts.com will NOT share, sell or rent email address or technical information to any third party companies or interested parties for any reason ever. A cookie is placed on the hard drive of a visitors computer from each page visited on the MoparTshirts.com web site. These cookies Do NOT contain any personal information. They are placed only for statistical tracking information only. MoparTshirts.com is committed to protecting the privacy needs of children. We encourage parents and guardians to take an active role in their children's online activities and interests. MoparTshirts.com does not knowingly collect information from children under the age of 13. MoparTshirts.com does not target its websites or marketing to children under the age of 13. Some links on the MoparTshirts.com web site may direct visitors to third party web sites. Please be aware that MoparTshirts.com are not responsible for the privacy practices of such other sites. We encourage our users to be aware when they leave our site and to read the privacy statements of each and every web site that collects personally identifiable information. This privacy statement applies solely to information collected by (and content of) the MoparTshirts.com web sites.